BARCELONA, SPAIN - JULY 5, 2015: Crowded La Rambla street at the heart of Barcelona, Spain. 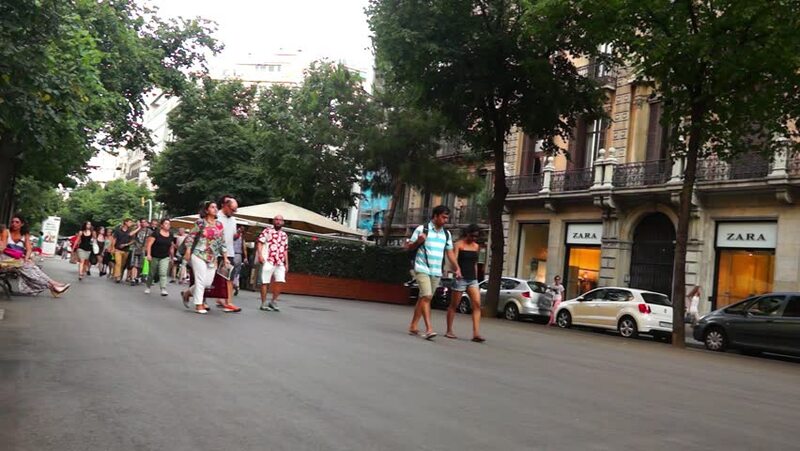 hd00:30BARCELONA, SPAIN - JULY 5, 2015: Crowded La Rambla street at the heart of Barcelona, Spain. 4k00:14MADRID, SPAIN - SEPTEMBER 9: View of the traffic on September 9, 2015 in Madrid, Spain. hd00:09London, United Kingdom (UK) - 07 12 2018: Scenes at Trafalgar Square in London getting Ready for president Trump visit. hd00:18Doi Ang Khang - JAN 25: Unidentified people enjoy cherry blossom on January 25, 2015 at Ang Khang Mountain, Thailand. Ang Khang, northern outskirt of Chiang Mai, is famous on cherry blossom time. 4k00:15MADRID, SPAIN - SEPTEMBER 9: Timelapse view of daily life on the street on September 9, 2015 in Madrid, Spain. hd00:19Doi Ang Khang - JAN 25: Unidentified people enjoy cherry blossom on January 25, 2015 at Ang Khang Mountain, Thailand. Ang Khang, northern outskirt of Chiang Mai, is famous on cherry blossom time. 4k00:14Budapest, Hungary - 5 august, 2018: Undefined people walk across the street at the traffic lights in the city. hd00:20WASHINGTON DC - JULY 9: Viva Ashraf Protesters standing in front of White House in response to the massacre in Camp Ashraf, July 9, 2011, Washington D.C. Massacre in Camp Ashraf occurred on April 8, 2011.